Delivery costs is R400.00(Jhb & Pta). Outlying areas attract an additional cost. 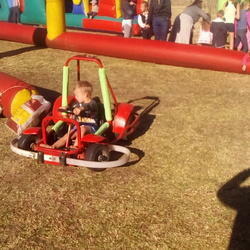 Have a go-karting kids party at your home or at any other venue of your choice. A mobile unit (travel to any venue) that offers rides on battery powered go carts for kids between the ages of 4yrs till 10yrs of age. Carts are self propelled, very safe, quick and easy to set up. To ensure maximum enjoyment, rides are supervised by our team throughout the function duration. * hard surface (tar, concrete, paving, hard ground, etc.) preferable. Grass surfaces also acceptable. 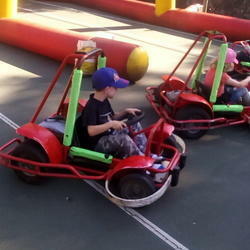 The minimum hire period for the go karts is 2hrs, plus delivery costs. Call to make arrangements.